This is helmet cam footage of a rescue made during firefighting operations. SCAUWG - The Southern California Airspace Users Working Group came to presence soon after the 1986 Cerritos Air Disaster. As a result of this accident and other near mid-air collisions (NMAC) in terminal control areas, the Federal Aviation Administration required that all airliners be equipped with traffic alert and collision avoidance systems (TCAS), and it became required that light aircraft operating in dense airspaces be equipped with "Mode C" transponders that could report three-dimensional position. SCAUWG past projects have significantly influenced the shape of the safer Southland Airspace that has evolved. Via SCAUWG participation, VFR Transition Routes have been designed, waypoints to be used for more accurate position reporting have been depicted and named appropriately, Input for Improved Published Charting has been submitted, Airspace Analysis has been conducted, In-Flight Hotspot Areas have been identified, and Innovative, Constructive Safety Suggestions have been acted upon. SCAUWG participation in various task forces has resulted in Improved Airspace Design including examples like the Class Delta Airspace solutions north and south of LAX, that now allow for certain IFR traffic to divert from their desired flight paths, and whilst doing so, remain in controlled airspace. One of the most important projects SCAUWG has contributed to that Southland pilots enjoy the benefits from daily, is the identification and depiction of LA Basin Flight Intensive Training Areas. You are invited to survey all of the 29 published FAA published Terminal Area Charts. Your mission WILL NOT FIND ANY of them that has the amount of significant "training area" information charted, as does the LA TAC. In fact, results will indicate that only a precious few even make reference to any intensive flight training area. 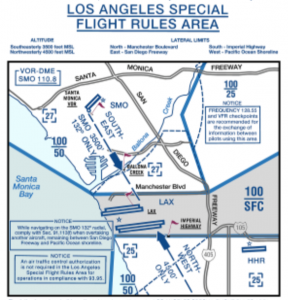 As a direct result of work done by SCAUWG, the LA TAC not only identifies 13 LA Basin Flight Intensive Training Areas, but often the chart also defines not just one, but two recommended air-to-air frequencies to be used by operators within them that are determined by flight altitude. SCAUWG made a significant contribution to safety via the development of those frequencies, and to the chart depiction labels that also relate which areas are used for aerobatic training. One of the oldest projects devised by SCAUWG is the contribution made by members Barry Schiff, pilot and Jack Norris, FAA via the development of the Flyway Chart. This chart was developed in the early nineteen nineties for flight planning use by VFR pilots. That Flyway Chart is still depicted on the reverse side of the current LA TAC, and was a monumentally important addition to the VFR pilot's toolbox at the time when it was developed. Today, after facing so many area airspace procedural changes, and the development of the SoCal Metroplex, one of SCAUWG's most important action item tasks is the desire to encourage the update that chart! Motivated by the desire to encourage and enable safe flight in the southland, SCAUWG members have regularly authored and presented seminars to the LA Basin Flight community that illustrate the challenges flight is our area present, and how best to navigate them. These presentations are often in part FAASTeam sponsored. What follows below is a small portion of past presentations developed by SCAUWG members. Webmaster Note: As many know, this version of our SCAUWG website is relatively new. One of my future goals will be to "organize" this list. As for now however, the files are in no particular order, and can only be selected by whether they are .pdf files or .ppt files.